Read customer feedback. Hotels Bali available for booking! See the customer feedback. Hotels Bali that make your stay magical are Jimbaran and Kandara. The excellent customer feedback hotels Bali’s Karma Jimbaran describe the world of a Karma Group resort. Featuring 40 deluxe villas equipped with contemporary amenities and furnished with style and elegance, the Karma Jimbaran sets the bar high for luxury accommodation. Each of the villas comes with a tropical garden and a private swimming pool. Book your stay at the Karma Jimbaran and experience the lavish side of Bali! Offering you an immersive experience, you will see the Balinese tradition in the open, spacious rooms decorated with local pieces of art. The villas are painted in calm, pastel colors vibrating with serenity and comfort. Inside you will find a state-of-the-art gourmet kitchen and en-suite bathroom. Just read the testimonials of our visitors to get a glimpse of their journey with us. View the customer feedback. Resorts Bali to visit for an exquisite vacation are Kandara and Jimbaran. 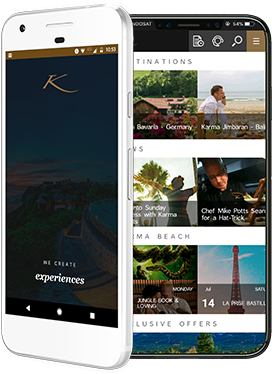 The lavish Karma Kandara has some of the best customer feedback resorts Bali in the Karma Group collection of spectacular places. Featuring the acclaimed di Mare restaurant which specializes in Mediterranean cuisine, you can enjoy your dinners on a fabulous clifftop with a panorama. If that is not enough, we can also offer you cocktails at the Beach club or in the Morrocan Temple bar. Moreover, if you are a wine lover, then the VERITAS Wine Bar and the vast collection of red and white wines will be your best indulgence. Furthermore, if you are a fan of spa treatments in the resort is one of the best spas on the island. Book your stay at the Karma Kandara and indulge in a comfortable villa! I truly feel blessed & convinced that I must have done some good karma in the past to be part of the prestigious Karma Group! A visit to Bali Life Foundation arranged by Karma Resorts Bali was wonderful! Thanks to Karma Royal Boat Lagoon Phuket for making my holiday great! We all enjoyed every minute at Karma Bavaria and vowed to return in the not too distant future! Had a fabulous week long stay...would have liked to stay on. The resort location, layout and ambiance is worth mentioning.